8 During the night I had a vision—and there before me was a man riding a red horse! He was standing among the myrtle trees in a ravine. Behind him were red, brown and white horses. 16 “Therefore, this is what the Lord says: ‘I will return to Jerusalem with mercy, and there my house will be rebuilt. And the measuring line will be stretched out over Jerusalem,’ declares the Lord Almighty. Verse 8 tells us that the prophet Zechariah had this vision at night, but I have decided to show the scene as a daytime vision picture. The sun provides the illumination for this scene from above. From left to right: the interpreting angel, Zechariah (in red) the Angel of the Lord (pre-incarnate Jesus) on a red horse, three angels on red, brown & white horseback. Background ravine landscape scene, without the horses or figures. I thought I’d include the background without the figures & vegetation, so you can see the ravine more clearly. The figures & horses in the complete scene (see above) are standing on a raised, level piece of rocky outcrop, in the foreground. Zechariah is called “the prophet of hope.” He was given 8 visions in the space of 1 night, that collectively look at the future for the Hebrew people during the coming centuries of pagan empire, to the coming of Messiah & the ultimate 2nd coming of Messiah. Things of note about the first vision. The Hebrew transliteration ‘adom can be translated red &/or ruddy, & can be used in reference to people, livestock (e.g. horse, heifer), to garments, water, vegetables (e.g. lentils), etc. Bay (aka chestnut) is a hair coat colour of horses, characterized by a reddish-brown body colour with black “points”: mane, tail, ear edges, and lower legs. Bay is one of the most common coat colours in horse breeds. Myrtus communis – Common myrtle; native to the Mediterranean region in southern Europe. Myrtus nivellei – Saharan myrtle; native to North Africa. I have decided to draw Myrtus communis (Common myrtle) in my picture. “Common Myrtle is a medium-sized, fragrant, evergreen shrub. Its leaves are opposite, simple, leathery, elliptical and lack a petiole. Myrtus communis blooms in the summer with white flowers that have numerous stamens. The fruits are black berries. The plant is rare in Israel as a wild plant, and is found as such in the Upper Galilee and the Golan Heights. It is extensively used as a domesticated plant in gardening. The oil extracted from its leaves plays an important role in folk medicine. Myrtus communis has been in use since antiquity among the Jews as well as among other nations of the region: for ritual, medicine, perfume and incense. It is one of the four kinds blessed on Sukkoth. Although the vision took place in late January/early February, & Common Mytle doesn’t flower until the summer, I decided to have the bush in bloom… after all, anything’s possible in a vision picture! The ravine in the Bible quote above has been possibly identified with the Kidron Valley, which is east or southeast of Jerusalem. It is thought that these fragrant evergreen shrubs may have been abundant there. 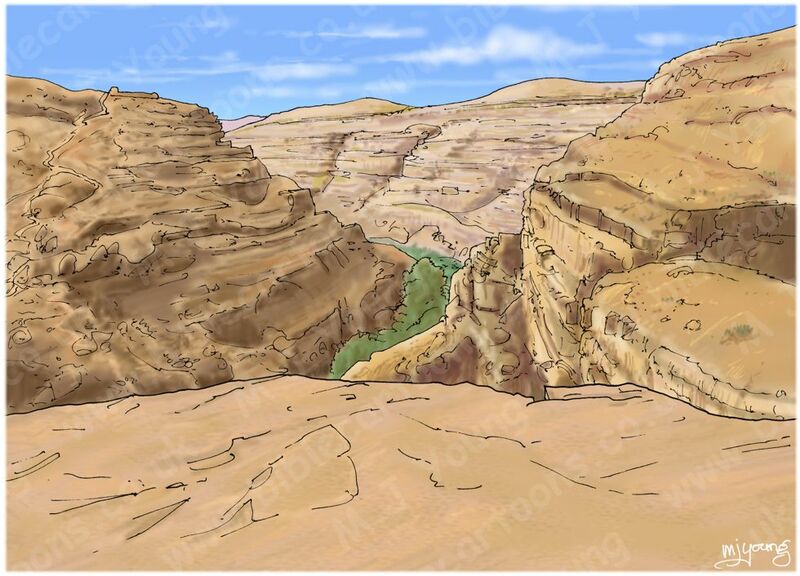 I have found some reference photo’s of the Kiddron Valley, which form part of the background of my scene. Red (bay or reddish brown – see above), brown (sorrel), and white. The Hebrew transliteration of brown is “saruq”, meaning sorrel, reddish, tawny &/or speckled. While the term is usually used to refer to a copper-red shade of chestnut, in some places it is used to refer to any reddish horse with a same-color or lighter mane and tail. Remember that a bay horse may have a similar colour body, but always has black “points” & in this detail is different from a sorrel horse. This Hebrew word translated “brown” (NIV) or “speckled” (KJV) is onkly found once in the whole of the Old Testament (here in Zechariah chp 1), so that its meaning is not certain. The Hebrew transliteration of white is “laban”. The actual significance of the colours is not stated in the Bible quote above. The angel who was speaking with Zechariah was not the same angel astride the red horse, but is referred to as “the interpreting angel” by some Bible commentators. 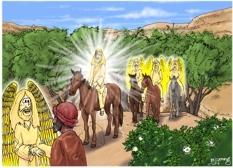 The interpreting angel is to the left of Zechariah in my picture.